I think it's probably better to wait, I'm currently trying to get color support to work and that's gonna need some more time. But if poeple think is good enough the way it is now you can put it in and I'll just keep working on a better version. I haven't tested it on other gtk versions tough. Beautiful theme, makes it all but impossible to spot the difference! One small glitch - the scrollbar areas are the wrong colour in Firefox (38 and 39 at least). This doesn't seem to affect any other gtk2 application, so it might be a bug on their side. Screenshot with Breeze colour theme, on planetkde.org - the page background is conveniently the expected scrollbar colour. 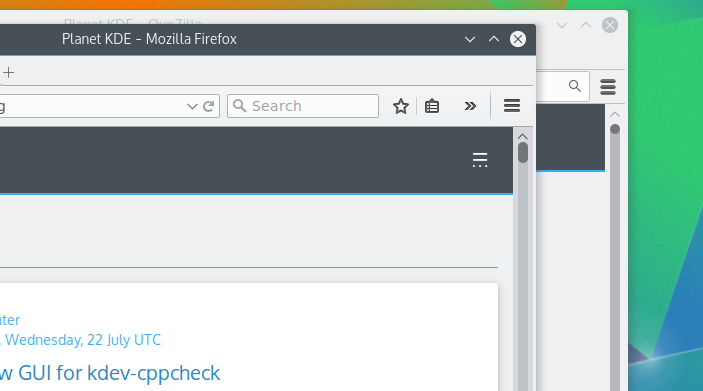 Qupzilla has the expected look, Firefox is a bit darker. With breeze-dark the scrollbars are instead a bit lighter than expected, not sure about other colour schemes. The theme certainly looks more consistent than using Orion at the moment, but it isn't perfect. Some GTK 3 applications will still look a bit off if they have a menubar as that will appear above the toolbar, giving you an unsightly grey space in-between Kwin's window decorations and the toolbar. Also, we're still working with Satya to refactor and start the GTK 3 theme from scratch. Or rather, we haven't had a lot of time to tackle it yet, as evidenced by the lack of updates recently. All that said, the majority of people who have used the theme so far seem pretty fond of it, so I don't think merging it as something of a preview would be premature. I would appreciate any help you could offer, David, as I'm sure getting it to work involves more than simply cloning our github repo to KDE's. We probably still need a file to tell systems where the theme itself should be placed, for instance. There are a few other bits that need changing when it merges into breeze with regards to setting the defaults, but I'll take care of that. That sounds like a great plan to me- thanks for offering your expertise. Is https://github.com/scionicspectre/BreezyGTK the latest repo? 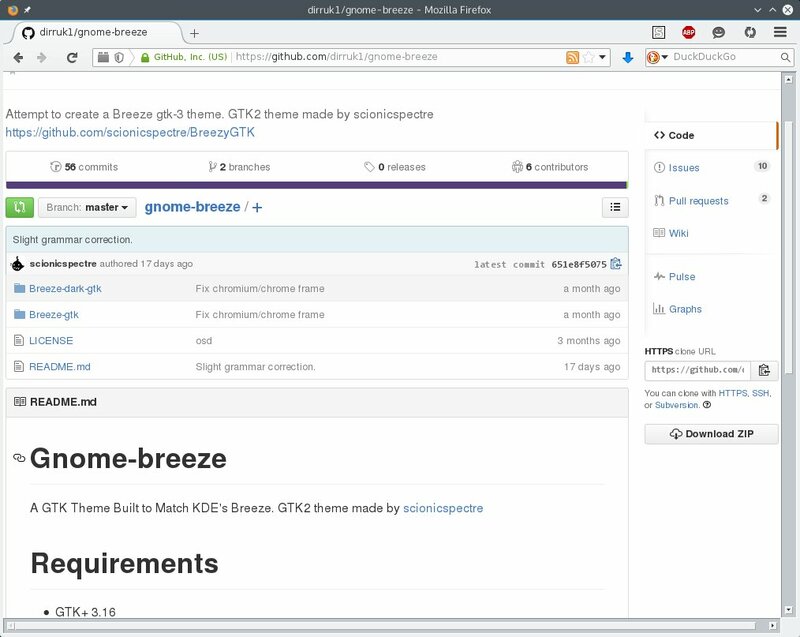 https://github.com/dirruk1/gnome-breeze is the theme's current home, and probably will be up until we all start working on it upstream in KDE's repos. Ok, well when you want it merged into Breeze let me know. Do you know if anyone is working on packaging gnome-breeze in Debian? Did you install gtk2-engines-pixbuf ? Had the same problem and installing this package fixed it. Also, there is a slight visual difference between scroll bar elements (spacing and shape) if you pay attention. time for master to ship it with plasma 5.5? Is anyone still working on GTK Breeze themes? There weren't any updates in a while.